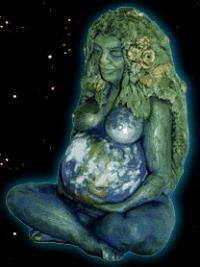 Many Pagans believe in some version of a goddess like Gaia, who created the earth. Nonetheless, it does place certain limitations on a woman’s body. I know Kat would let me know if she needed anything special at the Red Temple gathering I’m hosting next month. Still, I’m trying to be proactive by making sure she has a place to park near the event. And I’m pretty sure we’ll all be willing to get RIGHT out of her way when she needs the bathroom! For some women, this may be the first time they’ve experienced much in the way of physical limitation. Despite the ads that show happy pregnant women doing yoga and strutting off to work in perfectly coordinated maternity outfits, the reality is that many women experience pain and fatigue along with other symptoms that may make it less comfortable for them to participate fully in Pagan rituals and experiences. Of course, in a perfect world every woman (Pagan or no) would have access to caring medical professionals and a supportive community to make sure all her needs — physical, emotional and spiritual — were met. I know Kat is blessed in many ways, and I also know there are many Pagans in our community who already feel a bond to her daughter Mary Athena. I can’t wait to meet her!